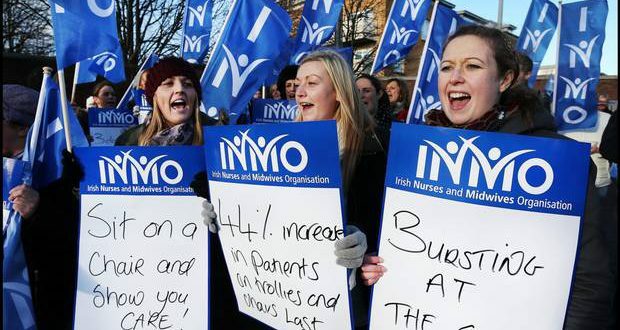 Nurses and midwives, who are members of the Irish Nurses and Midwives Organisation (INMO) are scheduled to begin strike action on 30 January. It is to be the first day in a series of 24 hour strikes by the union and the Psychiatric Nurses Association (PNA). The usual arguments are being made by media that nurses are “holding patients hostage” as well as outright lies about pay rates for nursing and midwifery workers. Even worse the other union that organises nurses in the health service, SIPTU, appears to be prepared to side with the government against the INMO. SIPTU Health Division Organiser and Labour Party councillor, Paul Bell, in effect stated that SIPTU nurses would cross the INMO picket lines. He went on to stress that SIPTU nurses would remain bound by the current public sector pay deal. 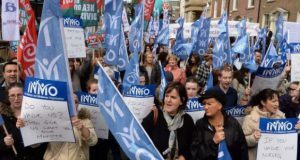 The INMO issued a tweet to state that it was experiencing a “surge” in membership applications which could possibly be from SIPTU nurses defecting. Nurses and midwives, like all public sector workers, are still worse off than they were before the economic crash of 2008. The current Public Sector Stability Agreement, which runs to December 2020, doles out pay restoration at 1% or 1.75% every six to nine months over three years while rents are rising by 11% per year and house prices are beyond the reach of all but a minority of the very best paid workers. It takes a nurse or midwives well into their thirties before they hit the maximum of their pay scale. The strike is important because of the radical deterioration of working conditions in the health service. Regularly working without taking breaks, trying to provide complex and highly skilled care in an overcrowded and often chaotic public health system and litigation and defensive practice are all major sources of chronic stress that drives many to sick leave. This results in the mass defection of nurses to other countries like Australia, the U.K. and Canada or burnout and stress for those who remain. Nurses and midwives are bearing the brunt of the establishment’s determination to degrade the public health system. The INMO’s action also poses huge questions for the trade union movement. Should workers allow ourselves to be tied into deals which see us merely marking time or sliding gently backwards in terms of pay and conditions? Particularly when we consider the cost of putting a roof over our heads is increasingly unaffordable? Since 2008 workers across the economy have endured huge cuts to pay and, equally important, huge changes to terms and condition. Decent pensions, for example, are becoming a thing of the past. How do we stop this trend? We need to mobilise the power of the workers movement and rebuild the traditions of solidarity and militancy that built the trade unions in the first place. We need an end to rotten deals and sell outs. Where workers vote to take industrial action there must be no more behind the scenes efforts to call off strikes for more ‘talks’. Given the legal hoops that the union movement must jump through to hold a strike, when workers vote for strike action then that is what must happen. We need a wholesale clear-out of those in the trade union movement who have no faith in the ability of workers to fight to better their conditions. Every trade-unionist and worker in this country stands to benefit if the INMO win this battle against a callous Fine Gael government. Workers must therefore give 100% solidarity and support to the INMO and PNA on the picket lines from 30 January onwards. A victory for the nurses and midwives is a victory for all workers. Take all private hospitals, pharmaceutical and healthcare companies out of hands of profiteers by putting them into democratic public ownership.